Korean soups and stews are some of my favorite dishes to eat. Like last meal favorite. I used to frequent local restaurants for my fix, but as I became more concerned with the quality of my food and discovered just how bad all the nasties in restaurant food were (MSG, rancid vegetable oils), I set out to learn how to create my own. I hope this recipe satisfies the cravings for fellow Korean soup addicts. There are just a few must haves and unfortunately no good substitutions. So get out there and find an Asian grocery store, and for those of you who don’t live near a good Asian grocer, you can typically order them online. Korean red pepper paste (gochujang) – This is a spicy, savory, fermented product that should ideally only have 3 ingredients: red peppers, rice and salt. Today lots of companies add high fructose corn syrup, maltose, wheat, MSG and other stuff we don’t want. Look for a paste in a glass container and check the ingredients. Some Asian grocery stores have their own homemade versions sold in the refrigerated section that can work. When you get your paste, take a tiny taste of it, as different brands have different heat levels. The heat level can even vary within brands at certain times of year. Tasting it before you cook with it will allow you to adjust the heat levels of your final dish. You can find Korean red pepper paste here. Korean red pepper flakes (gochugaru) – Look for a brand made in Korea and store it in the freezer between uses. Please avoid the temptation to replace gochugaru with cayenne powder, Mexican chile powders or even Thai chile powder. They are all very different flavors and aren’t interchangeable in this recipe. You can find Korean red pepper flakes here. Fish sauce – I’m sure most of you know this ingredient very well. It’s a staple of Southeast Asian cooking. You should look for a brand that has simple ingredients. Anchovy, salt and sugar are the most a fish sauce should have. The small amount of sugar in the Thai fish sauce is of no concern since it’s fermented, so the live culture gobbles most of that up. You can find good quality traditionally fermented fish sauce here. I went to the farmers market and the Asian grocery store this past weekend. Since I cook so often, it’s not unusual for me to walk out with a healthy dose of fresh produce. While I have included the produce I used to make this soup I encourage you to explore what’s in your neck of the woods. A good rule of thumb: include something green, something colorful, something earthy, and something astringent. I’ve also listed a range of amounts for the produce I used and optional vegetables. You can make this as veggie-ful as you like. I went for the full effect and they all added a great variety of texture and aromas to the broth. 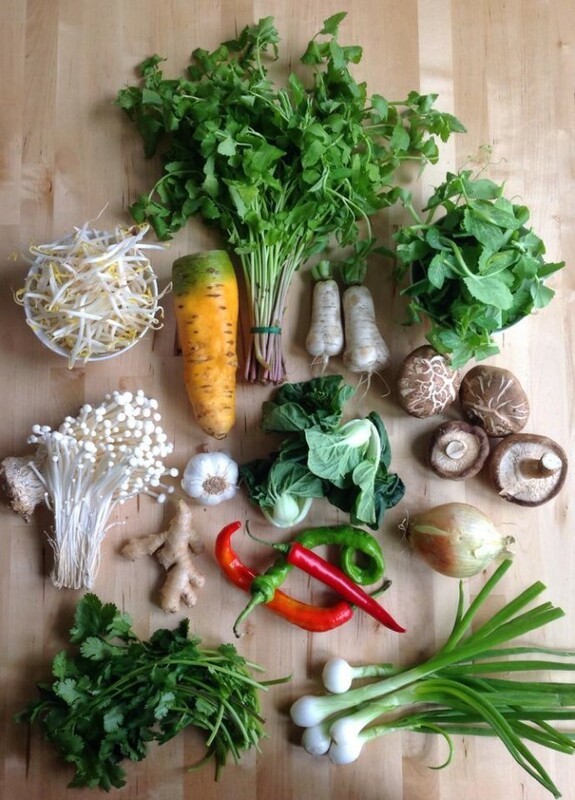 Most Asian vegetables are easily found at farmers markets and standard grocery stores. But it’s worth it to explore the options available at an Asian grocery store. I like their mushroom selection and hard to find veggies like water dropwart (also known as Korean watercress or minari). As for the fresh chiles in this recipe, know your limit. If you love spicy food (let’s hang out) then go for the three like me. But I won’t make fun of you if you deseed your chiles and I won’t even make fun of you if you skip all of them. Keep in mind we are using powdered chile powder and paste as well. For this stew I like a mix of fish and shellfish. I head to to the fish market and see what looks good and fresh. Select a firm white fish (like snapper, grouper, rockfish, or even monkfish – though note monkfish would take a bit longer to cook). The tautog is delicious. They feed on crustaceans and their flesh has a light shellfish flavor. I would recommend shrimp with the head or at the very least with the shell. It adds a lot of flavor and nutrients to your soup. Note about clams – never use clams that are open or chipped. If opened, slightly tap against counter and if they don’t close up, then toss them. You also want to soak the clams in the fridge with fresh cold water for 20 minutes prior to cooking to help them purge any sand. While supporting a local fishmarket or fishmonger is often your best bet for good quality, sustainable seafood, you can also purchase it online at I Love Blue Sea and Vital Choice. In a heavy pot, heat lard over medium-high heat until it melts. Add onion, sliced chile peppers, and sliced white scallion. Fry them gently in the hot fat, until they begin to brown slightly, 3 to 4 minutes. Stir occasionally. Add garlic and ginger, stir continually until very aromatic, about 2 minutes. Take care not to let the aromatics burn. Ladle in warm broth, scraping up any bits of aromatics they may have accumulated on the bottom of the pan with your spoon. Bring to a light simmer, and add Korean pepper paste and flakes, fish sauce and honey. Stir, taste and add salt as needed. If it's a bit too spicy for you, tone it down with more honey. Bring broth to a boil and add radish, shiitake, carrots, enoki and baby tatsoi. Once at a boil, decrease the heat to its lowest setting, cover, and then let it cook about 15 minutes. We want the vegetables to soften and add flavor to the broth. Add the water dropwort or watercress, pea shoots and reserved green scallions. Bring back to a light simmer for 5 minutes, then lower the heat again. Add shrimp and clams, cover and allow clams to open, and then add fish chunks. Careful not to overcook the seafood. Once the seafood is cooked, taste one last time, making any necessary adjustments for spice and salt. Remove from heat, add garnishes, and serve with rice. 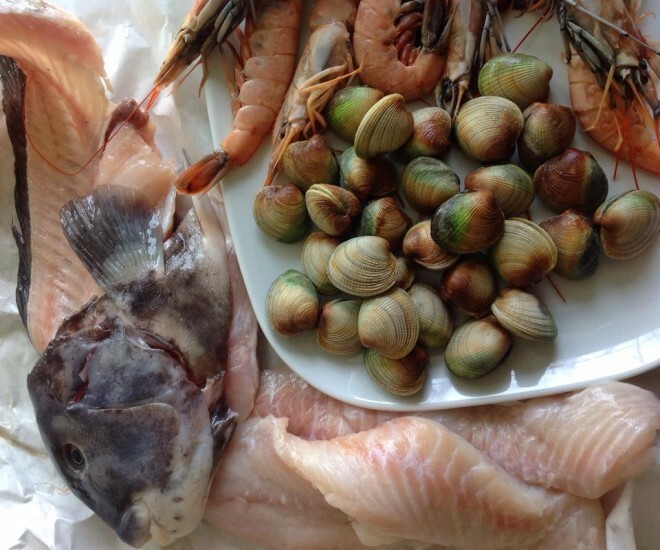 If you cannot find it locally, you can order sustainable fish, clams and shrimp online here. 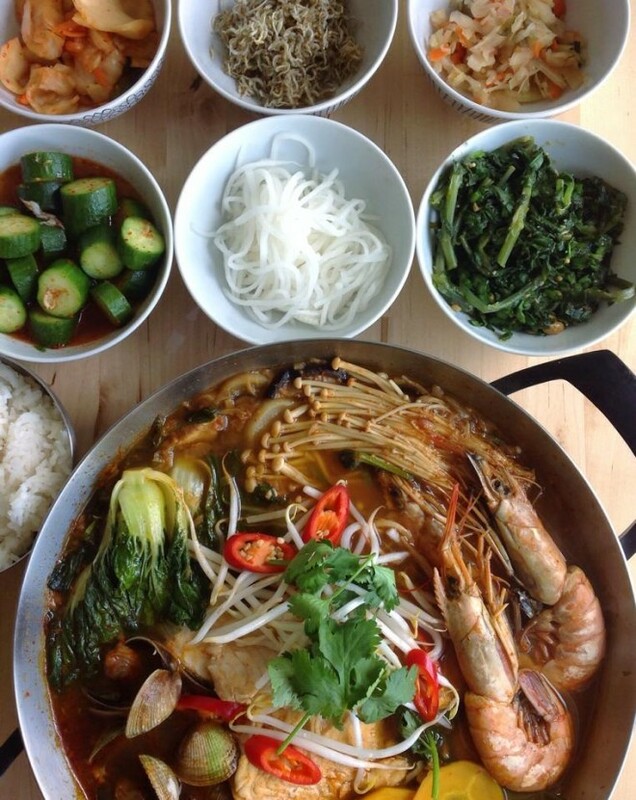 This seafood soup is traditionally served with a variety of banchan - traditional Korean sidedishes. The product you link to with the , “You can find Korean red pepper paste here,” link contains both corn syrup and wheat. It seems incongruous to link to that after your statement about not going out to eat because we encounter the same product there. This looks like a fabulous soup! Question though : if one doesn’t eat shellfish what would be the optimal substitute protein? Thanks! Thank you! If you aren’t able to do shellfish you can just stick to fish. Maybe use a couple of different species for variety. You will still have a delicious soup. Thanks Leslie! You should get yourself to an Asian grocery store! But it is definitely a great dish for a special occasion. I hope you enjoy. What is an acceptable substitute for the fish broth? Chicken stock or water? What I would do (and I’m not the recipe devleoper on this one), would be to take the heads and/or shells from the shrimp and boil them in chicken stock to make the broth. Or I’d use Japanese fish stock (dashi) which is super easy to make at home as it just uses bonito flakes which are shelf-stable and found in many health food store, asian markets and online. Hi Hilary- Jenny made some great suggestions. For my fish broth I like to use the fish carcass with the head (gills removed), shrimp shells and heads (crushed in my blender with a lil water) and a handful of dried baby anchovies. I also include vegetable scraps I have saved up in my freezer. That can be anything from onion and carrot trimming to bits of celery. Hope that helps! Thanks for your comment. i agree about not needing any pre-made seafood stock. a thing i like to do is roasted shrimp shells in the oven for a bit til fragrant, add them to filtered water and slowly simmer for about a half hour then dish them out with a slotted spoon. takes a bit more time for yout prep, but the end result is a richer, earthier broth, in my opinion. Haemul jigae! Love this stuff! When I was in Korea several years ago, I had a fantastic bowl of this, and I encountered a new ingredient for the first time. It’s hard and chewy – like a piece of tire – whitish in color, and roughly the size of a marble. I asked the waitress what it was called, and she replied “mee-da-da”. I imagine it would be spelled 미다다. I asked what it actually was, and she got a friend who spoke better english, and the answer was, “It is of the sea.” FAAANTASTIC. Fast forward a few years, and I’m at an H-mart in Annandale, VA. Sure enough, in the frozen section, there’s a bag labeled “미다다”. I flipped the bag over and read everything I could. I still have NO IDEA what this stuff is! Very frustrating! Does anybody have a guess what it might be? 7 years, and I still don’t have an answer. As hard and chewy as it was, I’m guessing it’s just mean to flavor the stew, rather than be eaten. Not sure, though. Hey Doug, That’s so curious! I’ve heard of dried sea worms as the secret ingredient for pho…and the use of dried scallops in Chinese dishes, but not what you mention. We need to do some serious research. Hopefully someone knows! A quick google and I came across some folks using: warty sea squirt and sea pineapple in their fish stews…so maybe it was something like that? Hi, Came across this wonderful page. It’s mea-du-duk -[미더덕] stalked sea squirt – wash well in water and include in seafood soup. 🙂 It can get very hot so don’t let it all burst in your mouth without cooling it. Also, you can use beef bone stalk for soup base and essentially use similar vegi but include beef meat instead for those who cannot eat seafood. Hi Ju! Thanks so much for the mystery ingredient confirmation. What is the korean name for this soup? What can u use instead of lard? Is there a healthier option? Lard is healthy, Molly. It is comprised primarily of monounsaturated fat (the same heart-healthy fat found in olive oil and avocado), and is extraordinarily rich in vitamin d.
Ah…my mouth is watery, just looking at the photo. One of my all time favorite dishes my mom makes! But since some of us are allergic to shellfish, she only uses salmon and other types of fish. Salmon has healthy Omega-3 so it’s win win if you can’t eat shellfish. I don’t mean to add uninvited comments but since I grew up eating this all my life, I’d just like to add a few suggestions. Broth – you can make broth with Kombu or just use filtered water like my mom does since the fish and seafood you are using will make the broth while making the stew. Lard – traditional Korean seafood stew does not use lard, even if its healthy, since Salmon creates a lot of good fat. Honey – you can omit honey since onions makes the broth sweet enough. Cilantro – I love cilantro but it’s not used in Korean cooking. If you want to make it real authentic and you can find it, add “Crown Daisy” ( sukgat) or Chrysanthemum_coronarium at the very end, before serving. It almost tastes like cilantro but not quite. But even if you don’t use these tips, this recipe is as close to the authentic Korean Seafood Stew as it gets! Great job! Hey all, thanks for your wonderful feedback on my recipe! Any advice about how to source sustainable shrimp? I almost never buy it because I have trouble finding any trustworthy sources. 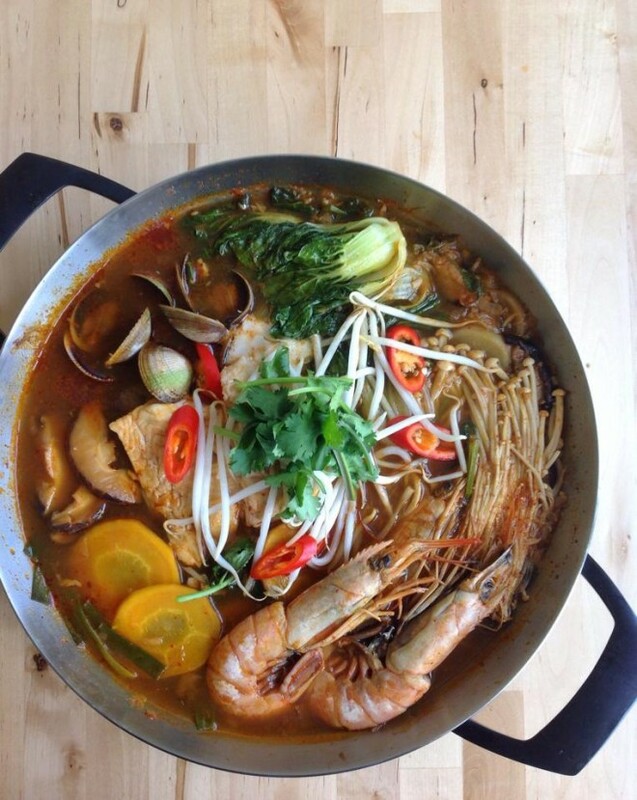 What substitutions do you suggest for the lard, fish stock, fish sauce, etc that would make this a good vegetarian (no fish, no poultry, no meat) dish? That would be an entirely different recipe.